Stalin, once said to his son, “No, you’re not, You’re not Stalin and I’m not Stalin. Stalin is Soviet power. Stalin is what he is in the newspapers and the portraits, not you, no not even me!” That is what Jayalalitha is, an institution. She is the government, she is the party, she is the only mover and shaker. There is no Jayalalitha the individual for the people and the individual Jayalalitha existed only for the select few. I was in her state for the last eight years on and off and her presence all over was overwhelming. And even from my childhood, what I know regarding Tamil Nadu is only Jaya and Karuna. Either this one or that one, but it’s only one of these two. Her iron will, her guts to take the challenge come what may, the contempt with which she barged back to power has no parallel in India. Her credit lies in the fact that however flawed her governance model may be, many attempted to emulate but none succeeded completely. Yes, she suffered and she was insecure; may be it made her this strong and recluse, but don’t forget she made people dance on their toes, she made and unmade men in the party, she decided everything. Her freebies, may be on the extreme, pressured the state but won her the masses. Did she do anything for the state? May be. But the fact is that even after all these years, Tamil Nadu still is in the top three state level economies of India. If she didn’t develop, at least the duo of Jaya and Karuna maintained their position. This, despite the crores spent on freebies. How many can trash the best of the journalists on screen? How many can make thousands wait before the hospital or call lakhs for their funeral? The adulation of the masses, the respect other leaders had, how many can command? That is the real eulogy for her, the iron butterfly – the masses who came for her final journey. And something for Karunanidhi, her arch nemesis to contemplate – There were a brother and sister who used to fight regularly over a TV remote. One day, the sister went to a hostel. What will be the mental state of the brother? 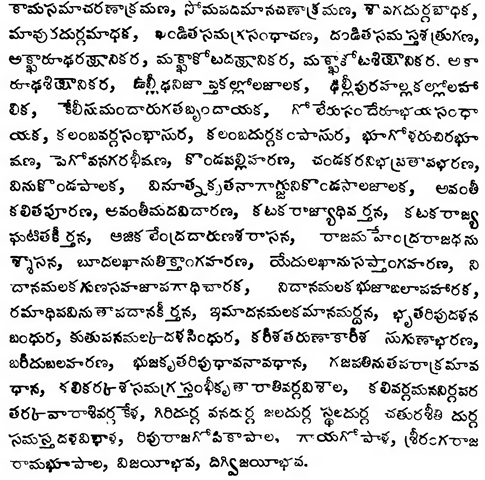 Below is the title of praise(Birudagadyam) of Ramaraya taken from Ramarajiyamu. This gives a clear picture of the extent of his achievements(well, some may be just fiction like that of Warangal or Cuttack unless he is a leading general of the Kalinga expedition) as well as how such titles are written. Rettahalli Sima Pratishthita Dhama Sagara Constructor of tanks at Puttapalli and Rettahalli. Orugallu Nagara Poshana Protector of the city of Warrangal. Bellamukondavallabha Lord of the town of Bellamkonda.